My featured painting today is another by Velazquez. It is entitled An Old Woman Cooking Eggs and Velazquez completed it in 1618. It is an example of his kitchen scene creations which he made popular in the early seventeenth century and became known as a bodegón, which showed peasants eating or preparing meals and the utensils they used to prepare and serve them. It should not be forgotten that when Velazquez completed this work he was barely nineteen years of age. It, without doubt, demonstrates his talent for painting people and everyday objects directly from life. In some ways this painting was demonstrating his masterly painting technique for all to see and as we will see later, it was his to be his calling card for use in his search for lucrative patronage. The background of this painting, like Velazquez’s Waterseller of Seville, in my last blog, is dark and indistinct, and is in marked contrast to the often over-crowded colourful backgrounds of Dutch and Flemish kitchen scene paintings of the time, which were full of animated happenings. This is a more sombre scene. Like many of Velazquez’s early works, it demonstrates the influence of chiaroscuro, the artistic technique developed during the Renaissance, referring to the use of exaggerated light contrasts in order to create the illusion of volume. In this painting we have a strong light source coming in from the left, illuminating the woman, her utensils and the poaching eggs but at the same time casting the background and the boy into deep shadow. It is a wonderful display of the contrast of light and shadow, and as was the case with the Waterseller of Seville, Velazquez has utilised subtle hues and a palette dominated by ochres and browns. Before us we have two characters, an elderly woman and a young boy. I can find no evidence of a relationship between the artist and the old woman but what we do know is that he used her as a model in another of his works, Christ in the House of Martha and Mary, which he painted that same year and thus one assumes he knew the woman well because he has portrayed her so beautifully. She is sitting in front of a small clay vessel in which she is cooking eggs over a charcoal fire. From her facial features, such as her high cheekbone, we know that in her early days she would have been a true beauty but now these facial qualities are somewhat worn and we are aware that she has lived a hard life, which has taken its toll on her. Velazquez has imbued her with a solemn and contemplative quality. She seems transfixed by some unknown apprehension and appears to be lost in a world of her own and looks to have lost concentration with the cooking of her eggs. The woman holds a spoon poised over the pan in one hand and an unbroken egg in the other, as the whites of the eggs in the boiling liquid below thicken. It is almost as if she is just going through the motions of the food preparation and her mind is somewhere else. 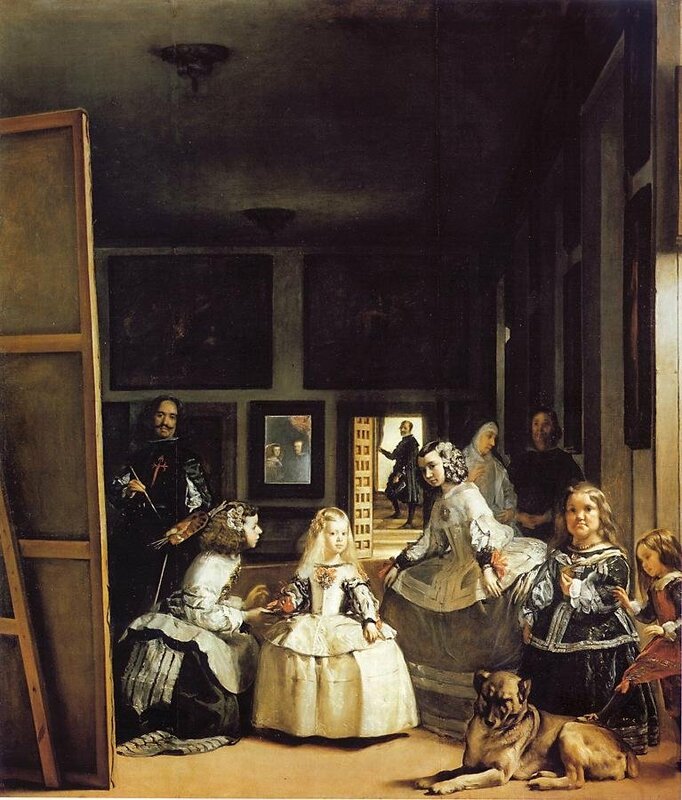 The boy on the left of the painting, which looks to be the same model Velazquez used in his Waterseller of Seville painting, strangely makes no eye contact with the old lady. He looks out at us and his demeanour is somewhat grave. Although not looking at the woman he is helping her as we see him proffering a glass cruet full of a liquid. It could be vinegar or oil but whatever it is, it has obviously been called for by the cook. His right hand cradles a large trussed honeydew melon. The contrast in the ages of the cook and her helper, as well as the egg the old lady holds in her hand, maybe symbolic of the passing of time and the transience of life as in a Vanitas painting, but maybe that is reading too much into the painting. However the beauty of this painting is not the depiction of the old woman or the boy but Velazquez’s mastery of his portrayal of the inanimate objects seen in the painting. In this kitchen scene, the common utensils used in preparing food, such as a mortar and pestle, pots, ladles, bowl and jugs have at least as important a place as the two characters themselves. Look how all these utensils are lit up against a much darker background. Look how Velazquez has incorporated into this work items made from various materials such as clay, wood, glass, brass, copper and pewter and how he has illustrated how the light affects them differently. Note the curved shadow of the knife which balances on the chipped rim of the bowl on the table. See how Velazquez has depicted the moist surface of the inside of the pan as it glistens above the egg whites. 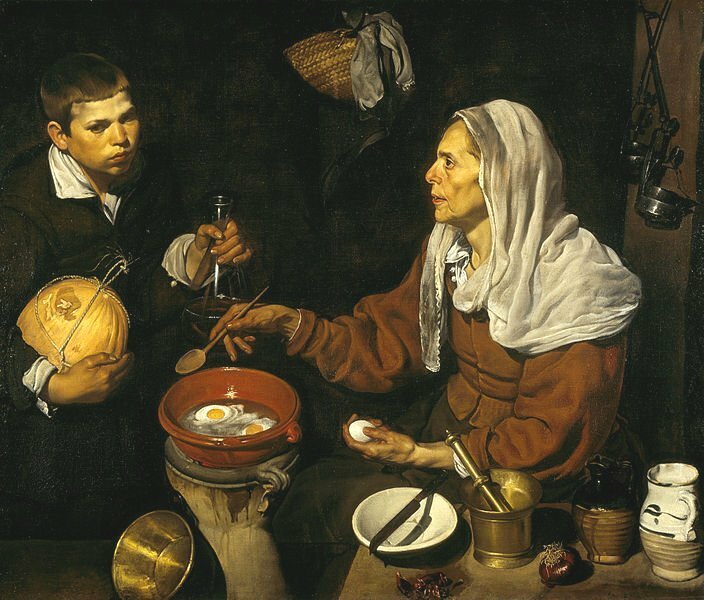 Observe how Velazquez has skilfully depicted the various textures of the items on display such as the eggshell, the straw of the basket which hangs on the wall in the background, the skin of the melon the boy is holding, the onion which lies on the table to the left of the woman, as well as the textures of the linen clothing and the string wrapped around the melon. It appears that Velazquez was fascinated with the different materials and textures and how the light and shadow danced upon both the opaque and reflective surfaces. All of these brilliant touches showcase the artist’s virtuoso performance. This is indeed a case of an artist showcasing his masterly painting techniques and offering proof of his artistic ability to the viewer of this work, who maybe a prospective patron. The following year, 1618, Velazquez married Pacheco’s daughter Juana and by 1621, the couple had two daughters. In 1623, due to his father-in-law’s connections, Velázquez was asked to paint a portrait of the young King Philip IV, the ruler of Spain. The portrait was viewed as such a success by the sitter that he immediately appointed Velázquez as one of his court painters, and from then on would allow no one else to paint him. This was the second of my Velazquez paintings which I wanted to give you before I headed for the sunnier days of Madrid. In my next blog, which I hope to send from the pool side of our parador, I will offer you a work by another famous Spanish artist, Francisco Goya and tell you about the connection it has with myself, as a naughty schoolboy, and my first sighting of erotica !!!! At the end of this week we are off on a five-day jaunt to Spain to sample the delights of the Spanish Paradores and so I thought it would be fitting to have my next few blogs focus on Spanish painters. Today I want to start by looking look at the connection between a famous Spanish painter and an English fighting hero. I want to explore the connection between the talented Spanish artist Velazquez and the great British general, Arthur Wellesley, the Duke of Wellington. My Daily Art Display today features not just one work but three very similar works, which were completed by the young aspiring Spanish artist in the early 1620’s and who was to become one of the greatest painters of all time. His name was Diego Rodriguez da Silva Velazquez. The works I want to look at today were all painted when he was in his early twenties. The paintings in which Velazquez specialised during his early career were known as “bodegones“. The word derives from the Spanish word, bodegón which lierally means taven or public eating place. In Spanish art, a bodegón is a still life painting depicting the preparation or eating of food, pantry items, such as victuals, game, and drink, often arranged on a simple stone slab, and also a painting with one or more figures, but significant still life elements, typically set in a kitchen or tavern. These works often depicted scenes of lowlife in earthy tones, and with a sense of sombre pathos, which were unlike similar works by the contemporary the highly-colourful Dutch and Flemish genre scenes by the likes of Jan Steen and Pieter Aertsen with their depictions of the happy, but poor, peasants. The title of Velazquez’s three painting is The Waterseller of Seville. Hecompleted these works during the period from 1618-1622. Art historians would have us believe that these works were the greatest of all his Seville paintings. Velazquez painted three versions of the work. The one shown above can be seen in the Apsley House in London. Another version of the painting, which was completed three years earlier, can be found in the Uffizi Gallery of Florence. The third version of the work hangs in the Walters Art Museum in Baltimore. Let us take a look at the paintings in detail. Before us Velazquez has portrayed a waterseller in the city of Seville. During the scorching heat of a Spanish day, to come across a waterseller would be a godsend. The role of a waterseller in Spain in those days was a common trade for the lower classes in Seville. The aguador was often mentioned in popular satirical Spanish literature, plays and popular imagery. The aquador or waterseller was frequently portrayed as a scoundrel or pathetic peddler, who operated on the fringes of urban society and hawked his often dubious wares to an unsuspecting public. This street water-seller was nicknamed the Corsican of Seville and who, according to accounts from the end of the 17th century, wore a smock with holes in it to show his scabs and sores to potential customers so as to eke out some sympathy whilst at the same time, boost trade. 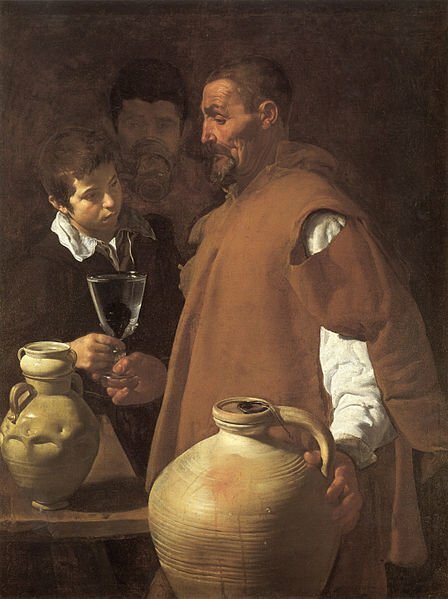 In Velazquez’s painting we can see that the vendor of water has two customers. One is a young boy and it is thought that the artist has used the same model for this work that he used in his earlier works, entitled The Lunch and Old Woman Cooking Eggs, a painting I will look at in my next blog. In the background and somewhat harder to discern is another young man who has also purchased a small jug of water from the seller. In the foreground of the painting we have very large jugs of water. Rivulets and glistening water drops slowly run down the ridges of this massive jug. Observe how Velazquez has cleverly depicted this main jug. It appears so close to us. It almost seems to bulge out of the painting. The chalice-like goblet, held by the young boy, holds centre stage as the light falls on it. Look carefully at the glass. It is not just a simple glass of pure water but in it floats a fig. This addition of the fruit was to act as a kind of perfumer with the intention of making the water taste fresher. 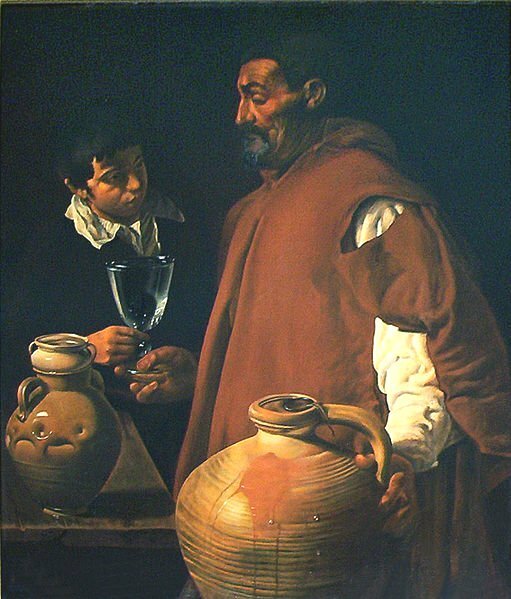 The most striking aspect of this painting is how Velazquez has portrayed the water seller. This is not a rich man. This is a man who has had to eke out every peseta the hard way. His facial expression is downcast. He has a look of resignation as he hands the boy the glass of water. The man behind, who is shown full face, can be seen quaffing water from a lifted jar. He has almost faded into the darkness of the background. The features of the water seller, due to his days on end of standing out in the harsh sunlight, have taken its toll. His face is rather haggard with age and ravaged and wrinkled by its exposure to the sun. He has been plying his trade for many years, never able to accrue enough to retire. The Apsley House version of the painting shows the seller bare-headed and in this version we can observe his short shaved hair. Velazquez’s aged aguador stands in profile in the company of two of his clients. He is dressed in coarse, monk-like robes. Look at his eyes. There is little or no eye contact between him and the boy. He gazes blankly. He seems to be lost in thought and has little or no regards to what is happening around him. The offering of water seems to be just a mechanical movement. The boy whose downcast, three-quarter glance is highlighted by a stream of light, hesitantly grasps the proffered goblet of water. He does not make eye contact with the waterseller. Is he too embarrassed by the plight of the old man? Velazquez in his depiction of the man and the boy has highlighted the sharp contrast in their lives. The battered and scarred face of the water seller contrasts greatly with the smooth white facial features of the young boy. 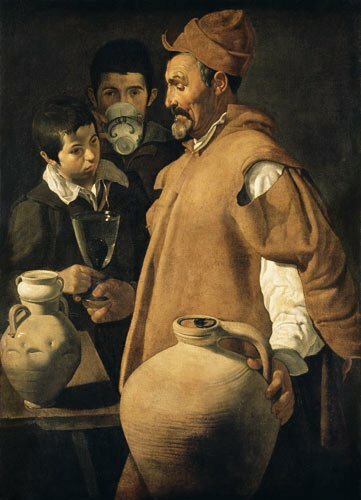 Velázquez’s portrayal of the waterseller is very profound. One can see that he sympathises with the man and his terrible “lot in life”, by the way he has portrayed the man. We can see that he shows consideration for the poverty and age of the street-seller, and has, in some ways, given him an air of quiet dignity . Velazquez by his depiction has represented a true-to life depiction of the waterseller and his trade. His carefully crafted work encapsulates the imperfections of the seller’s pots, the saturations of dampness on their sides, the glistening of the light on the small drops of water and the glass, and the realistic expressions of the characters. So what about the connection I mentioned in my introduction that this painting, the one which presently resides in Apsley House, had a connection with Arthur Wellesley, 1st Duke of Wellington? Apsley House, also known as ‘Number One, London’ stands on the north side of Hyde Park Corner. It is the magnificent former home of the Duke of Wellington and was granted to him by a grateful nation. The “Waterseller” painting originally was a prized part of the Spanish royal collection. In 1700 it figured in the inventory of the Buen Retiro Palace in Madrid. By the late 18th century it hung in the Royal Palace in Madrid. There it struck the fancy of Napoleon’s brother Joseph Bonaparte, who was the commander of French forces in Spain during the Peninsular War and, who for a short time was the usurper of the Spanish throne. When the French realized they were about to be driven from Spain by the Duke of Wellington, Joseph Bonaparte decided to leave Madrid but he was not going to leave the city empty-handed as he plundered numerous royal treasures before quickly retreating northward with his troops. However Joseph Bonaparte was not able to reach the sanctuary of France as he was caught by Wellington and his troops just as he was about to cross the Pyrenees. Wellington defeated Bonaparte at Vitoria and recovered from Bonaparte’s baggage train a number of Spanish paintings that had been cut from their frames, including the “Waterseller”. Wellington wanted to return the artistic treasures to the Spanish nation but the restored Spanish monarch Ferdinand VII gave them all to Wellington as a gift from a grateful Spanish nation. In the dining room of Wellington’s magnificent London mansion, Apsley House, the Waterseller of Seville hangs today as a fitting tribute to its liberator. The oil on canvas painting featured in My Daily Art Display today is a somewhat unusual, and to me, disturbing portrait by Diego Rodriguez de Silva y Velázquez entitled El bufón don Sebastián de Morra. 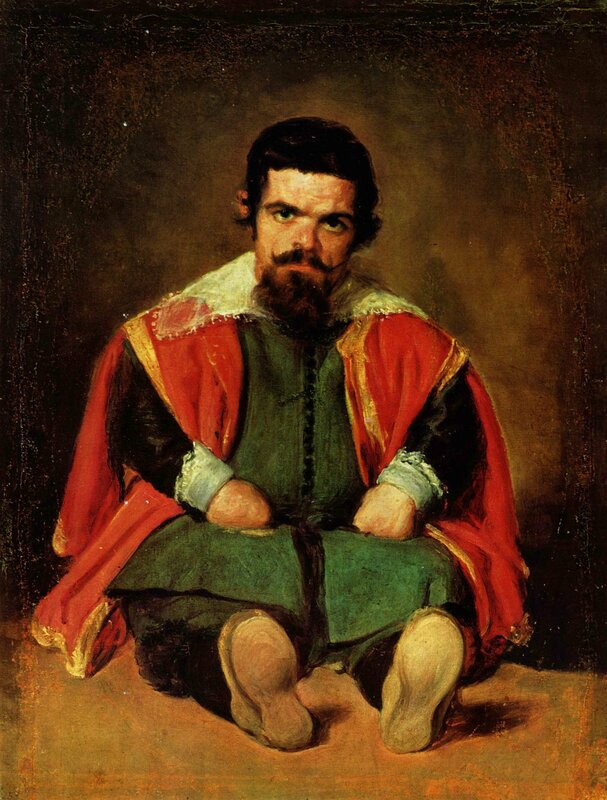 Sebastián de Morra was a dwarf and jester to the court of Philip IV of Spain. He was crippled from birth and sadly was the subject of ridicule and mistreatment from the nobleman at Philip’s court. He was the servant of the King’s eldest son and heir, the teenage Prince Baltasar Carlos. On the prince’s untimely death at the age of 16, due to contracting smallpox, Baltasar left in his will a small silver sword and other objects to Don Sebastian and from this gesture we must believe the two of them had a very close and amicable relationship. Velázquez painted the portrait of other dwarfs of the Spanish court. 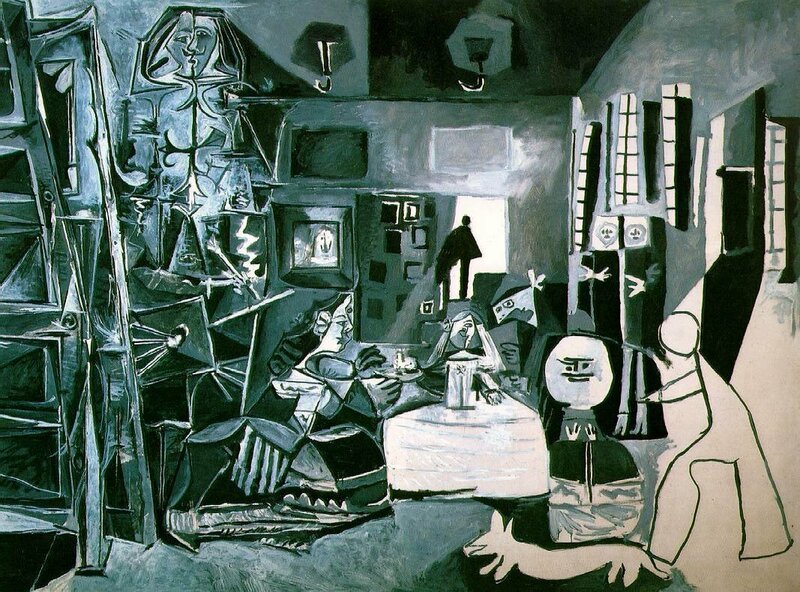 Look back at My Daily Art Display of December 27th when I featured Velázquez’s painting Las Meninas in which we saw the dwarf, Maribárbola. The German philosopher and art historian Carl Justi said of their life at court: “they were loved and treated as dogs”. These unfortunate people were often found at courts in the Middle Ages and were given shelter in return for their services as court jesters, a position which left them open to offensive remarks and practical jokes. It was their lot in life to accept such unkindness and had just to be thankful that they had a roof over their heads. This painting by Velázquez around 1646 is, by far, one of the painter’s most impressive and unforgettable works. Against a dark background we see the figure of the dwarf, Don Sebastián. There is a lack of elegance in the way he sits on the ground. He is leaning slightly to one side. His foreshortened legs stick out and he reminds us somewhat of a puppet which has been abandoned and his strings released by his puppeteer master. His tightly clenched hands rest on his thighs. He looks intently out at us making us feel slightly guilty that we are staring in at him. Can you look at him for any length of time without wanting to turn away as if you know you shouldn’t be staring at him? He looks somewhat annoyed. There is sadness in his dark eyes, which is contrary to his role as a jester, when his sole aim was to exude happiness and make people laugh. Maybe his expression is to remind us, lest we forget or are swayed by his opulent attire, that his life is not full of fun. Although he displays a dignified air, he also looks tormented and gloomy. He wears a plush red and gold cape with a flamenco lace collar over a buttoned green doublet. His clothing, although splendid, cannot conceal from us his menial position in the court and this is emphasised even more by the fact that this sad diminutive figure is seated on the bare ground and not within the opulence of a court setting. Was it in the mind of the artist, or from the instructions of his patron, that the dwarf, Don Sebastián, should be dressed lavishly so as to portray to us, the viewers, that the jester was well treated and that he enjoyed the best life could give? Are we taken in by that premise?